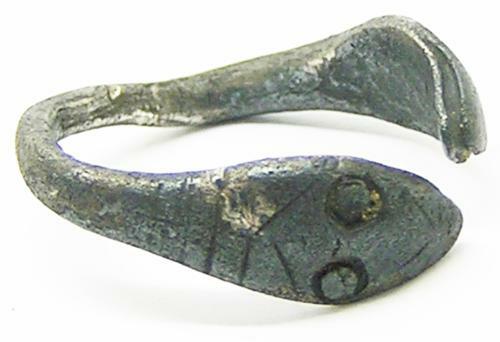 This is a wonderful ancient Roman silver finger ring, dating to the 2nd century A.D. It is of penannular form, decorated with two facing snakeheads. A similar ring found in Oxfordshire discussed here PAS-942FE3 and Suffolk SF-8BEF14. This snake ring is of Johns Type Bi, there are numerous parallels from the Snettisham jeweller's hoard, (Johns, 1997, 36-37 and 100-105, nos243-274). The snake during this period was associated with healing, the goddess Salus and Asclepius all have associations with snakes. This type of ring would have been worn for good health, often sold at temples and shrines such as the healing waters of Aquae Sulis (Bath).